The Awakening Wood (めざめの森?, lit. : "Forest of Awakening") is an area in Pikmin 2, the second in the game, and can be accessed after retrieving the Spherical Atlas from the Emergence Cave in the Valley of Repose. This area is also mentioned to be The Forest of Hope from Pikmin. Olimar even makes notes to how much it has changed since his last visit, hence why he renamed it. The area bears four caves and seven treasures in total, which sum to × 765 in the US version of Pikmin 2 and × 805 in the European version. It is also the location of the first Blue and White Pikmin in the game, both of which are required to reach further areas. The area is Spring-themed, with grassy terrain, cherry blossoms, and objects and features that might be found in a garden; the great number of Pellet Posies make it arguably the best place to produce Pikmin. 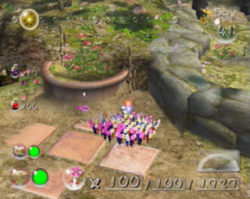 These features, along with its layout, make the Awakening Wood very similar to The Forest of Hope from the first Pikmin game. 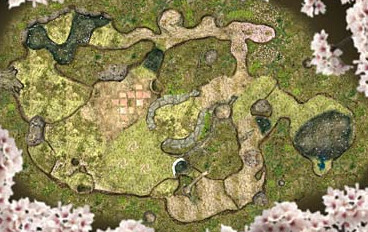 Olimar also states that he explored this forest before, in his journal entry for the Geographic Projection, but has now renamed it due to how much it changed. The ship and the Onions land in the southwestern portion of the map. To the west of the landing site is an open area containing a single Red Bulborb and some Dwarf Red Bulborbs. Near the puddle of water in this area is a small flower pot that is home to an Iridescent Glint Beetle. To the south of the landing site is a small area that contains several flower pots and a small natural ramp that leads to the top of the pots. This area has numerous Pellet Posies as well as several benign Female Sheargrubs, and a Burgeoning Spiderwort that only appears on day 11 and beyond. 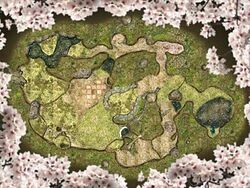 The rest of the map is accessible from two locations: one is a central area that contains two Burgeoning Spiderworts that, once a black bramble gate is torn down, opens to the western (which is guarded by a Creeping Chrysanthemum), eastern, and northern portions of the map. The other is over a small bridge that must be constructed which leads directly to the western portion of the map. The western region of the map is linear like a corridor, and stretches from the north to the south. On the northernmost side of this corridor portion is the entrance to the Hole of Beasts. Following the path to the south leads to a moderately sized pond with two Yellow Wollywogs and two bridges that can be built. The southwestern portion of the map is at a higher ground level and, as such, can only be accessed by traveling through the western passage. It contains a Burrowing Snagret and the Snagret Hole inside of a tree trunk behind a white bramble gate. A few Pellet Posies, including one that yields a 20-Pikmin pellet, grow on this region. The northeastern portion of the map is accessed after deflating a paper bag. Behind it is the White Flower Garden. Near the White Flower Garden behind an electric gate is a circular area that houses the Blue Onion and numerous Pellet Posies and Wogpoles. Traveling deeper through the northeastern portion, after taking down a poisoned bramble gate, yields access to the a portion of the map to the northeast of the landing site, after using a weighted seesaw block. This area contains a single purple Burgeoning Spiderwort and a small tree stump that leads to the Bulblax Kingdom behind an electric gate. This area can also be accessed after destroying a black bramble gate in a tiny puddle to the north of the landing site. This puddle can be drained. Female Sheargrub × 10 (decreases over time): Around the landing site. Dwarf Red Bulborb × 2: North of the landing site, on the tiles. Red Bulborb × 1: North of landing site, beside the ledge with the Sunseed Berry. Ravenous Whiskerpillar × 2: Nearby the two ultra-spicy Burgeoning Spiderworts. Cloaking Burrow-nit × 3: One beyond the Spiderworts, one beside the White Flower Garden, and one in front of the Blue Onion. Creeping Chrysanthemum × 3: One before the Hole of Beasts, one near the Geographic Projection, and one beside the Sunseed Berry on the ledge. Iridescent Flint Beetle × 1: Before the ramp leading to the Pilgrim Bulb. Honeywisp × 3: One near the two Burgeoning Spiderworts, one near the Pilgrim Bulb on the ledge, and one next to the Sunseed Berry on the ledge. Male Sheargrub × 4: Two by the bridge found near the Geographic Projection, two found by the bridges near the Air Brake. Wogpole × 3: In the pool of water with the Blue Onion. Yellow Wollywog × 2: In the pool of water before the Snagret Hole, guarding the Air Brake. Burrowing Snagret × 1: In front of the Snagret Hole. The central area of the map contains two Burgeoning Spiderworts that produce red berries as well as housing a few Honeywisps. A purple berry-yielding Burgeoning Spiderwort can be found on the ledge that has the stump that leads to the Bulblax Kingdom. On the southwestern ledge of the map after ten days have passed there will be three 10 pellet Pellet Posies; one for each primary Pikmin types; and one 20 pellet Pellet Posy that periodically cycles through the three primary colors. The Blue Onion can be found in a large pool on the northern side of the map. Map of the Piklopedia version of the Awakening Wood. The small lake to the west of the landing site is absent; it's just a straight pathway. To the northeast of the landing site, the bridge that grants access to the Bulblax Kingdom does not exist, and instead, there is an unusable twig. The wall right next to the seesaw blocks that are close to the White Flower Garden has a small alcove. There is also a twig that overlaps the location of the seesaw blocks. The bit of the terrain where the White Flower Garden is is a pond. The large lake at the north of the area is missing, and instead, there is just flat terrain. The tree where the Snagret Hole is is absent. The pot with the Pilgrim Bulb and the pot near it have more or less swapped heights, and there is no ramp that allows access to the northernmost pot. Interestingly, the tree that the Healing Cask in the US version or the Hypnotic Platter in the European version are on has a root protruding onto the pathway, next to a paper bag; this root has a hole in it in the Piklopedia version of the area, but not in the in-game one. The same root in The Forest of Hope also has the same hole. Some vases near the landing zone. A collection of man-made elements: vases, stone walls and tiles. What appears to be a burrowed plate, under a drainable puddle. A lone Burgeoning Spiderwort and the entrances to the Bulblax Kingdom and the White Flower Garden. The paper bag in the area, that requires 200 Pikmin worth of weight. The area where Blue Pikmin are found. Location of the Blue Onion. A path filled with petals, near the Hole of Beasts. The pond with the two Yellow Wollywogs. The area with the entrance to the Snagret Hole. The Pellet Posies that appear after a number of days in the area. They are the largest in the game. 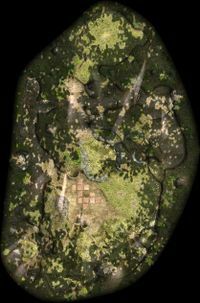 The layout of The Forest of Hope, for comparison. Carrying paths on the Awakening Wood. A map of the Awakening Wood. See more: Category:Awakening Wood images. An animation comparing the Pikmin 3 title screen with the Awakening Wood. The Awakening Wood was initially meant to be called the "Forest of Awakening". In Super Smash Bros. Brawl, the stage Distant Planet is based on the Awakening Wood. 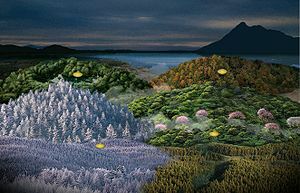 The Pikmin 3 title screen's terrain is an altered version of the Awakening Wood's west corridor. This comparison is detailed here. This page was last edited on November 3, 2018, at 10:42.